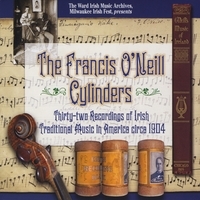 This historical CD contains thirty-two rare cylinder recordings from influential Irish traditional musicians created about 1904 in Chicago by famed collector Francis O'Neill. The music contained within these historic cylinder recordings offers a rare opportunity to those interested in Irish traditional music. Recorded sometime after 1904, these cylinders construct an auditory bridge to the written musical notation of traditional tunes collected by Francis O’Neill alongside his recorded musical companions. The sound recordings allow us to hear the music that is a frozen skeleton on O’Neill’s printed page coming alive in the flesh and blood of a real performance. The recording captures performances by noted uilleann pipers Patsy Touhey, James Early, and Bernard Delaney, as well as fiddlers John McFadden and Edward Cronin.